While out on riding Iowa’s bike trails I have come across interesting items left behind by others. When looking at my collection of Bike Ride Treasure I always see it’s functional purpose. A hat is to be worn on the head, a tennis ball to be hit with a racket, a baby blanket used to soothe a fussy infant. However when Iowa artist Julia Franklin finds things while riding her bike she looks past function and finds inspiration. Julia’s latest art installation Lost and Found is on exhibit through the month of January at the Des Moines Social Club . Along with objects found on bike rides and walks, each piece of art includes a cycling element. 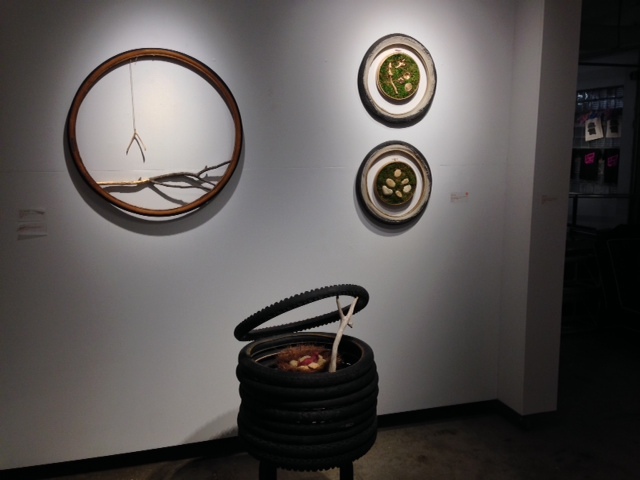 Many pieces are framed with recycled bike tires donated by the Des Moines Bicycle Collective. Visiting the exhibit I enjoyed taking my time to closely examine each piece. There is beauty in the treasure Julia has found. When brought together nests, broken pencils, orange peels, and bike tires transform from something insignificant to something magnificent.